Here are some notes about mentoring from yesterday’s workshop, “I’m an experienced graduate student?! Tips and advice for sharing your knowledge.” Thanks to Janice DeCosmo, Lindsey Madison, and Julie Cass for contributing their mentoring expertise! Thanks also to everyone who submitted questions for the panel. This entry was posted in Mentoring, Workshops on March 31, 2016 by Heidi. WCS is excited to announce the new chemistry department peer mentorship network! The goal of this program is to help incoming grad students with questions about starting grad school (research, classes, moving to Seattle, work/life balance etc.) as well as integrating them into the department when they arrive. We’re currently recruiting both mentors and mentees! If you’re a current chemistry graduate student, check out our mentor sign-up survey and expectations here. If you’re an incoming UW chemistry grad student, check out our mentee sign-up survey and expectations here. We’ll be pairing mentors and mentees based on survey responses and would love to have as many people involved in the program as possible. To kick off our mentoring program and start broader discussions about mentoring, we’re having a workshop on Wednesday, March 30th at 5:00 pm in CHB 102. Entitled “I’m an experienced graduate student?! Tips and advice for sharing your knowledge”, this event will feature a brief presentation by Janice DeCosmo, the Associate Vice Provost for Undergraduate Research. Following this, we’ll have a panel discussion with Janice as well as Julie Cass and Dr. Lindsey Madison, both experienced graduate peer mentors. Also, there will be pizza! You can RSVP on facebook and invite your friends here. Whether you’re pursuing a career in academia, industry, or something else, mentoring is an important skill related to management, leadership, and teamwork. Experience with peer mentoring can help you develop these valuable skills for working with people. Plus, understanding both sides of the mentor/mentee relationship can help you manage your relationships with your advisor and other mentors. We’ll keep collecting and sharing more resources beyond our mentor network and workshop, so stay tuned! This entry was posted in Events, Mentoring, Workshops on March 23, 2016 by Heidi. 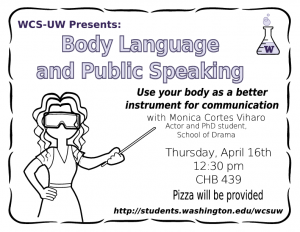 We’re hosting a workshop this week, “Body Language and Public Speaking,” on Thursday, April 16 from 12:30-1:30 pm in CHB 439. 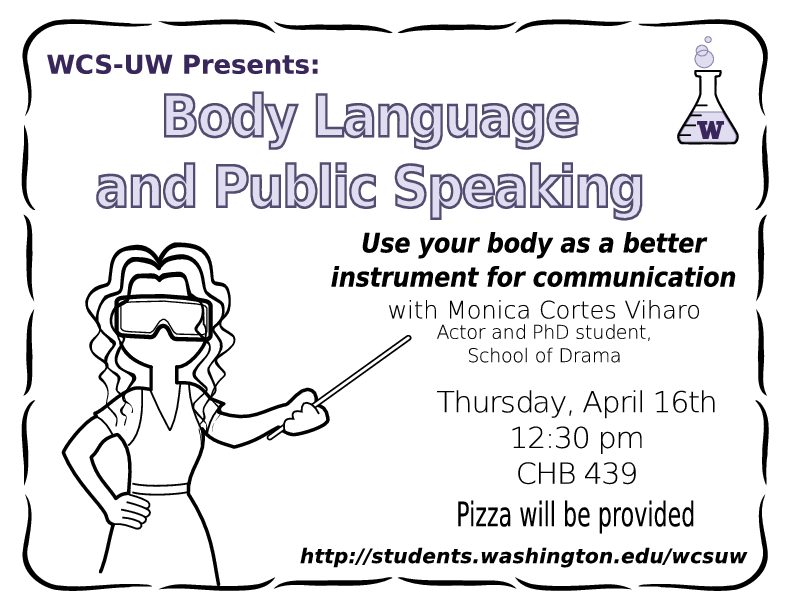 The workshop is hosted by Monica Cortes Viharo, an actor and PhD student in the Drama department. She will focus on ways to use your body as a better instrument for communication, as well as public speaking fears, body language, and the qualities of a strong speaker. Get ready to prepare for your next academic presentation or job interview! And come hungry, because there will be free pizza!! This entry was posted in Events, Workshops on April 13, 2015 by Addie. Yesterday, WCS hosted a workshop entitled “Social Justice in Action: Small Steps Leading to Change” and led by Dr. Caprice Hollins of Cultures Connecting. Dr. Hollins is a very engaging speaker, and she made a point of introducing herself to everyone in the room and remembering all of our names. She began by telling us about her family and background, helping to set a context for our discussion and providing frequent examples of how she recognizes and applies these ideas in her own life. One topic we discussed was how developing self-awareness can be a starting point for improving your interactions with people from other cultures and groups. If I start by considering my own story and motivations, I can better understand how I react to other people, interpret situations, and make assumptions. I can also acknowledge the contexts where I have privilege as a member of a dominant culture, and admit when I have biases about people of other cultures. Although most people want to believe that they’re fair and unbiased, we’re still all susceptible to unconscious bias (remember the study where male and female professors rated male applicants more highly than female ones?). And I can’t do anything about my own biases if I don’t admit that they exist. Dr. Hollins also mentioned the importance of admitting how your assumptions about others affect your interactions with them. As an example, she told us about a time when she approached someone and realized he was in a wheelchair; she felt self-conscious and tried to act like she hadn’t noticed, which just made the conversation awkward. Trying to ignore others’ differences (in race, ability, or any other area) can make them feel like their experiences are invalid. 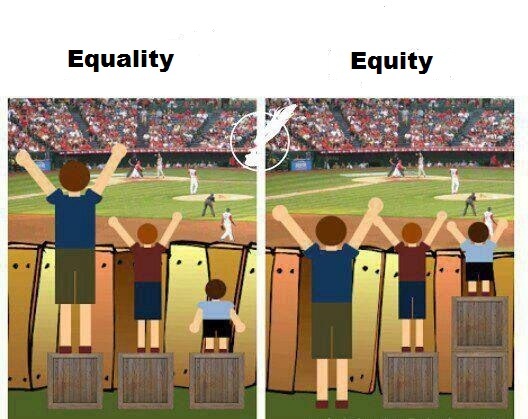 These differences can have a huge impact on someone’s life, and acknowledging that is necessary for engaging with them – even if it also forces you to acknowledge your assumptions, which makes you uncomfortable. Finally, someone asked for advice on what to do when you’re on the other side of the conversation – when you feel offended or discriminated against. Dr. Hollins outlined two common types of responses, which many of us could identify with: predatory listening (finding points to argue and being confrontational) and avoidance (waiting and venting to someone else rather than addressing the problem directly – I definitely do this one). She then advised us to get good at asking questions. It can be challenging to find real, curious, non-snarky questions that actually open up dialogue and engagement, but it is a worthwhile strategy to practice. Instead of treating someone as an enemy, I can help them learn, grow, and change. Overall, Dr. Hollins led a really interesting discussion and gave us all a lot to think about. I’ll definitely be more aware of my own biases and their effects. on myself and on others, from now on. This entry was posted in Events, Workshops on November 19, 2014 by Heidi.